leccy is onto something.. his speed trap values is showing that he is going all out... with DRS and all. does anyone knows the expected difference in lap times per tire for this year ? Do you think its possible the slow shutter speed is making it look like there is banding? If you look on the other images from this morning there is a time when he clearly has C1's on (ie no banding). I guess they might have changed the tires though. Leclerc posts a 1:18.247 on the C3 tyres! Just one-tenth slower than Sebastian Vettel's fastest time from Monday. 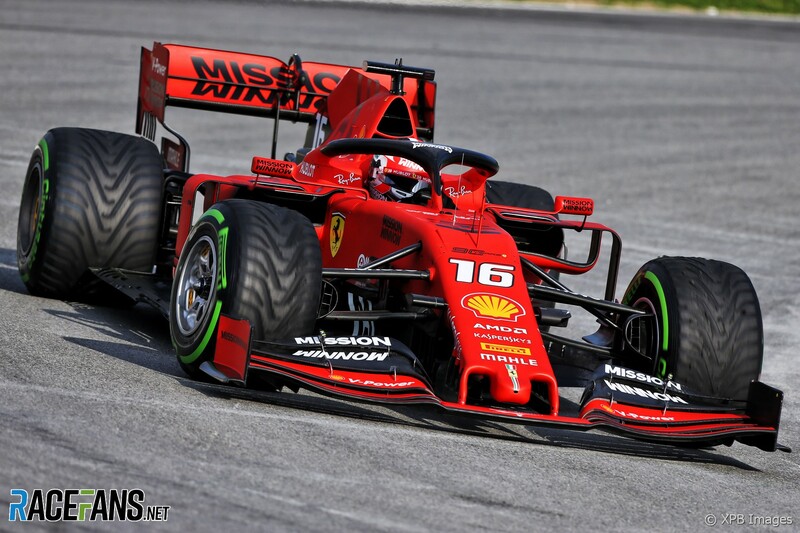 There will be 1:17 today for sure SF90 looks solid and smooth. Combining all three sectors, Charle's best time is 1:17.968 which is faster than Vettel's (1:18.061). But it's only testing so pretty meaningless comparison. 16:19 I've been out watching all the way from Turn 1 to Turn 9 this morning. The Ferrari looks very good and stable in the change of direction and the rear end in particular seems planted. The Mercedes still seems better on the kerbs, at T7 for example and their traction is still excellent. Lewis also seems the most comfortable to have just a tiny lift through the ultra fast T9 despite carrying a decent fuel load. The Honda’s gearshifts and engine note seem audibly much smoother than last year and I’m sure Gasly’s on a decent fuel load as he’s just pounding round and round with the Red Bull looking very consistent and balanced. That traditional strong front end in the medium/slow speed corners continues to be a characteristic and you can see how deep Gasly can go on the brakes into T1 and T4. Of the midfield cars, the Alfa continues to impress as a consistently balanced car and looks particularly good in the medium speed corners. That coat hanger wing at the back of the Ferrari wobbles like crazy. I thought these wings were being phased out by the FIA? Autosport: 16:29 It's a 1m18.371s for Leclerc, so close! He's struggling to pull all the sectors together into a perfect lap. 'Struggling to put all the sectors together'?, really... Does autosport really think this is a qualifying and has to show hand in all sectors in the same lap. lol, struggling? Kid looks like he has been driving the Ferrari for years very smooth and pretty quick. If 18's is struggling then I hope we struggle more lol. Thanks for your patience mate, they are indeed C2's. Anyone know why some cars have green lights blinking? Oh... Didn't know that, thanks! Means nothing but still - it is good to see the three Ferrari engine cars on p1-3!! thank you, i forgot lol, so who does the broadcasting through the early day? is it f1 tv exclusive? Are we messing up the wet condition stuff already??? Yes, I think the morning is just F1 TV. Still no live feed that works?